This novel challenges conventional ideas about the world. It is about keeping secrets and feeling out-of-place in the world, and seeing things that others cannot see. It is about the gulf that lies between people who see the same facts in very different ways. It is about the silent people who inhabit this gulf, this no-man's land, this invisible green world around us. The elusive river boy of this story is seen only through the eyes of Hebe, a young woman who is struggling to make sense of her world. Through knowing him, she learned to see nature with new eyes and also to dissemble as she tried to protect his secrets. 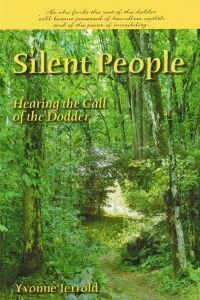 He was one of the dodder people, a hidden race more ancient than homo sapiens that lives on the edges of our civilization and whose survival depends on camouflage and silence. Hebe's search for him wanders the borders of fact and folklore, of science and art, of sanity and madness, as she catches glimpses of the power that draws the silent people back to their ancient roots. But is she the only one who can see it? There is nobody she can confide in. The habit of secrecy is too strong in her, long after her childhood faith and instincts have become overlaid with adult rationality.